When browse web pages with phone number on it, you may notice that the phone number has been highlighted and embedded in Skype code as colorful option-selectable button, preceding with country flag. If you hover the mouse pointer over the phone number button, you will read that the button allows you to call this phone number in the country with Skype, while the flag allows you to change country code. The change to phone number on webpages, together with a Skype drop-down menu on the menu toolbar or command bar is a feature of Skype. 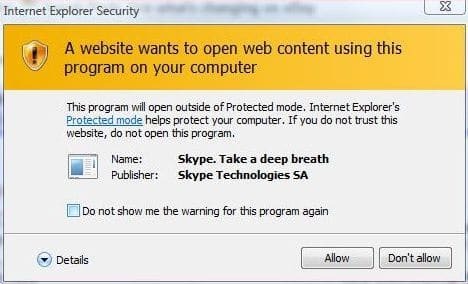 Other than above changes, when visiting a web page with phone number on Windows operating system beginning from Windows Vista and Windows 7, users may prompt with a Internet Explorer Warning dialog window saying “A website wants to open web content using this program on your computer” with the program name identified as “Skype, Take a deep breath” and publisher as “Skype Technologies SA”. The warning appear due to the program will have to be opened outside Protected Mode, a security feature of IE7 in Vista, and users must specifically allows the act to continue by clicking on “Allow” button or stop the Skype integration with IE by pressing “Don’t Allow”. Skype bundles the Skype add-in for Internet Explorer with the Skype client in order provides users with convenient way to initiate phone calls directly from the web pages by clicking on the highlighted phone number itself, which will launch Skype to dial the number. This shortcut to dial saves users from having to copy and paste or remember the telephone number and type the number in Skype interface. You may not like this feature and want to see the phone number in its ordinary normal form instead of highlighted by Skype, especially for users who seldom use Skype to make outgoing SkypeOut call to ordinary phone. (Note that if your IE crashes due to Skype add-in, which may happens to both IE7 on Windows Vista and IE6/IE7 on Windows XP, you should upgrade to latest version of Skype, which comes with latest version of Skype IE plugin). 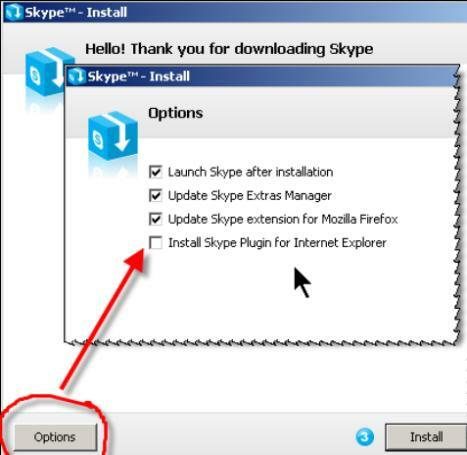 If you want to disable the highlight of phone number of web pages when viewed in Internet Explorer browser, you can uninstall and remove the Skype IE plugin. Apparently the built-in Skype IE Plugin remover is little buggy, as on some system, performing step above to uninstall and remove Skype IE plugin is not enough to get rid of the add-on and/or the menu button in the IE’s menu bar or toolbar. If there is still trace of Skype add-on still has hooks into Internet Explorer, try to use the following command to completely remove all references and hooks of Skype in IE by unregistering Skype IE Plug-in from the IE toolbar. In Vista, use an elevated command prompt. Close all IE windows before running the command. Still the Skype IE Plugin still persistent on your system, go to Internet Explorer, click on Tools -> Manage Add-ons -> Enable or Disable Add-ons“. In the Manage Add-ons dialog, disable all Skype items found, namely Skype and Skype add-in (mastermind). One last step is to search for SkypeIEPlugin.dll file (normally located in c:\Program Files\Skype\Toolbars\Internet Explorer\ folder) on your computer and delete the file. Again, close all Internet Explorer windows before deleting the file otherwise the file will be locked. Once the Skype IE Plugin is unhooked from IE and uninstalled, the phone number on web pages will appear as normal text again, and the Skype menu on Command Bar or toolbar is removed.